GATIS fellows held their first Young Researcher Committee meeting on February 12 2014 in London. The meeting took place during a GATIS Training Event at King’s College London. 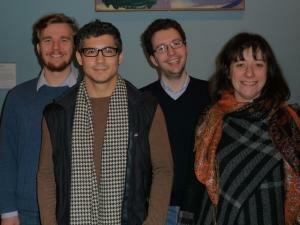 - Jonathan Toledo, early-stage researcher at Perimeter / Porto University (second from left). The purpose of this committee is to provide a forum where the young researchers can discuss their experiences within the Network, suggest changes if necessary, and bring forward their ideas for activities. In addition this committee should serve as an important learning experience.